As we like to say at ZimmComm New Media, a big Gold Star to our Jamie Johansen! 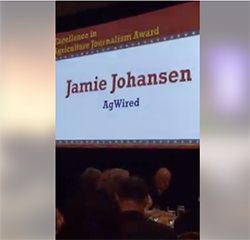 This morning Jamie received the Best of Beef award for Excellence in Agricultural Journalism. We are very, very proud of her. The Best of Beef Awards Breakfast is our chance to honor the cattlemen and women and cattle industry partners who go above and beyond to put our industrys best foot forward. Help us recognize these men and women for their outstanding service, dedication and commitment to beef. 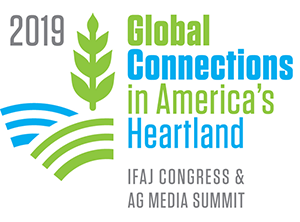 You can see lots of examples of her work this week at the Cattle Industry Convention on AgWired and on Animal.AgWired.com. Best of Beef also honored a couple of other communicators. First, is the Lifetime Service Award going to Evan Slack, Evan Slack Network. If you know Evan you know why he is a Best of Beef winner. He has probably forgotten more beef stories that most of us will ever experience. 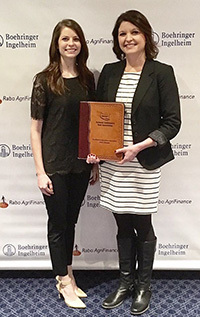 Also, Scarlett Hagins, Kansas Livestock Association, received the Excellence in Communications and Public Relations award. That’s just a no-brainer! Congratulations to all the winners. Wish I was there but, hey, Jamie is there so you’re in good hands.